Money can’t buy happiness, but plastic surgery can? When you are the overweight scorned daughter/sister-in-law of a rich family, at least you can count on your loving and wonderful husband to defend you, right? Well, not for Geum Ran, because she just found out that her husband is abandoning her in favor of a “sophisticated” broadcaster. Geum Ran reenters the scene as the “beautiful and transformed” Sara with the aid of plastic surgery. Together with Tae Hee, who has a plan of his own, the two seek revenge and perhaps find true love where they did not think to look. OK, so I have a serious problem with the glorification of plastic surgery in Asia, and it seems to be particularly prevalent in Korea. I mean I understand the desire to be more beautiful, but changing your own image through the means of surgery? I’m not sure I can get in line with that idea. Plus I feel like it just makes people more and more vain. I get it if its for medical purposes, but what’s the point of looking different if we all just end up going to the surgeon to get our imperfections “fixed”? And I’m sure once you fix one thing, you would want to fix all the other “problem areas.” Where does it end? ANYWAY, sorry for that long derailment. Back to the story. After I got over the fact that this drama plot line is not exactly meant to change our corrupt society, I started to see what this really is -another fluff piece. For those of you who have seen 200 Pounds of Beauty, then this set up is pretty similar, discounting the obvious fact that there are two dudes in this and only one in 200. Han Ye Seul plays the glamorous Sara, who retains the pure heart of Geum Ran. It’s as if to say she’s only perfect now that she looks “beautiful” on the inside and outside. Argh. Ok, maybe I have not gotten over the whole plastic surgery thing. what are you even studying, jsw? Joo Sang Wook remains the lovable goofball, expect with maybe more of an agenda this time around. 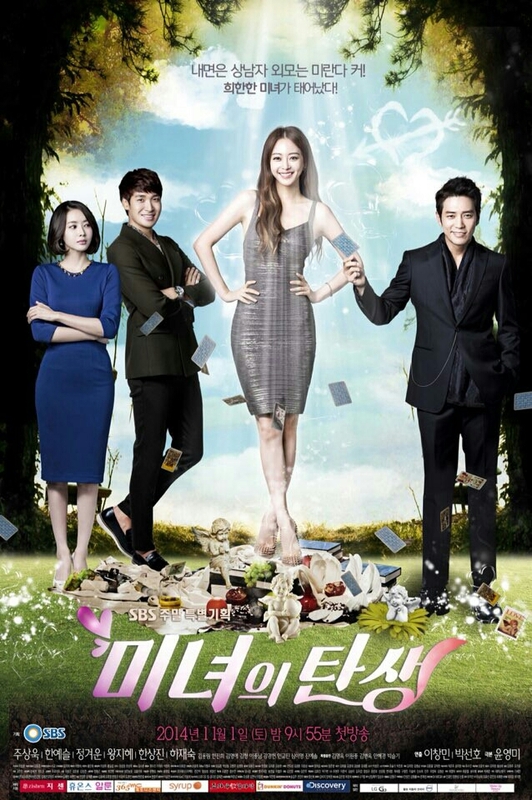 Jung Gyu Woon is new to me and his performance is meh so far – definitely nothing Earth shattering. Plus playing the cheating husband probably doesn’t win him any favors or induce any second lead syndrome. I did see Wang Ji Hye before in Protect the Boss, and I still can’t shake the feeling that her eyes are just going to pop out any moment now. Over all? It’s an OK show. It can go better if it starts to downplay plastic surgery or highlight the negativity of it (send a healthier message to viewers), but if it remains this shallow then this one might never see daylight on my list again. Han Ye Seul was embroiled in a dispute with KBS after she failed to show up to work one day due to work condition conflicts. She is currently dating 1TYM’s Teddy. Joo Sang Wook was in Cunning Single Lady earlier this year, and appeared in film The Huntresses as a warrior. He will hit the big screen again in 2015 film Trot. Jung Gyu Woon was recently in time-travel thriller God’s Gift – 14 Days and film The Legacy. He also managed to get married in between filming to his model turned web designer girlfriend on April 5. Wang Ji Hye played second fiddle in Hotel King. She won a SBS drama award for her role in 2013 series The Suspicious Housekeeper. I DONT GET THE CARD THING! is he a gambler?? ?